The six parts per billion (ppb) drinking water standard for perchlorate proposed by the state of California is based on the findings of a short-term study with a very small sample size, now known to be wholly inadequate to detect perchlorate-related health effects. The same is true for the drinking water standards proposed in New Jersey, the clean-up standard adopted by the US EPA, and to a lesser degree the drinking water standard recently adopted by Massachusetts. The authors averaged data within dose groups to claim that the lowest dose of perchlorate caused no effects on iodide uptake by the thyroid. Closer examination of the data, however, shows that four of the seven individuals did have perchlorate-related reductions in iodide uptake. 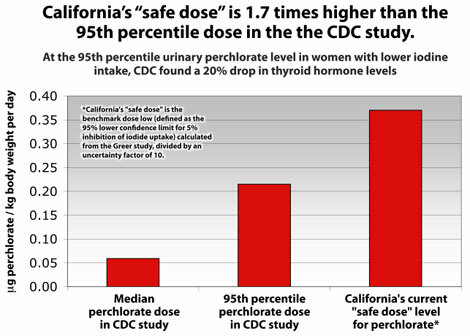 With the CDC study in hand, we now know that these effects occur in the population, particularly in iodine deficient women, and that the proposed California standard would not protect the public health.